The 80/75/15M station. 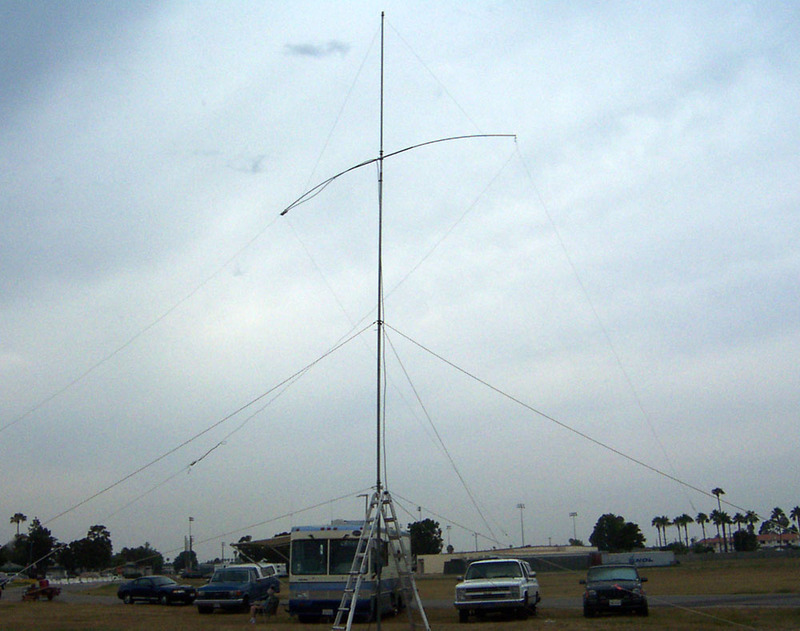 Immediately behind the trailer is a 50 ft mast with an 80M inverted-vee and also a longwire vee-beam pointed towards the East coast. 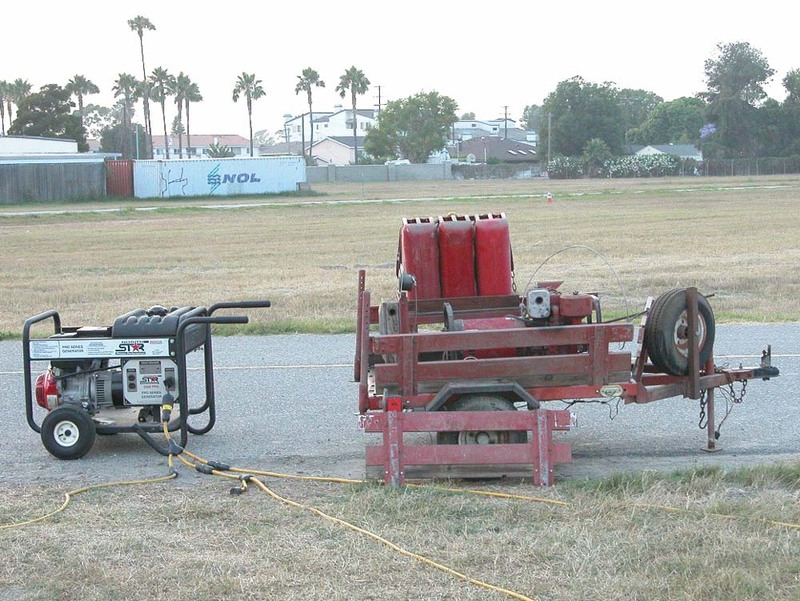 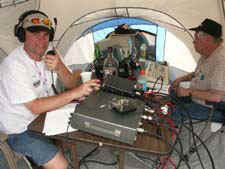 (L-to-R) are Gody-KR6FO and team captain Larry-K6VDP. 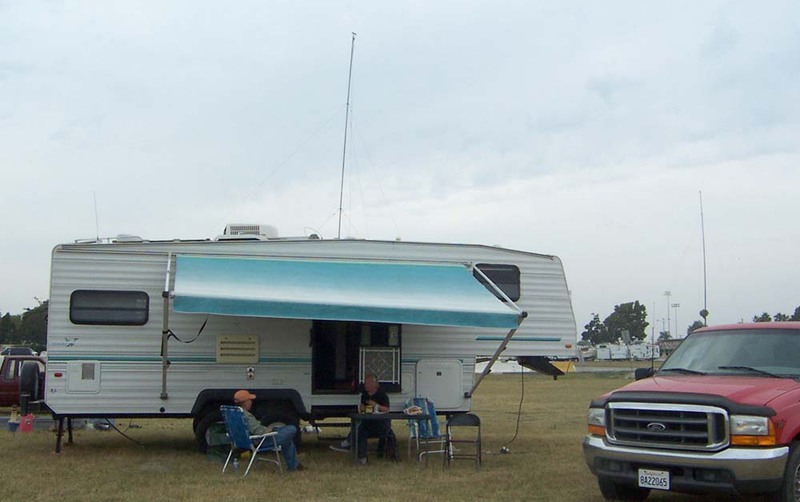 On 80/75/15M Jim-N6JF (shown) and Larry-K6VDP operated two different antennas. Notice the classic Harvey-Wells antenna tuner in the station. 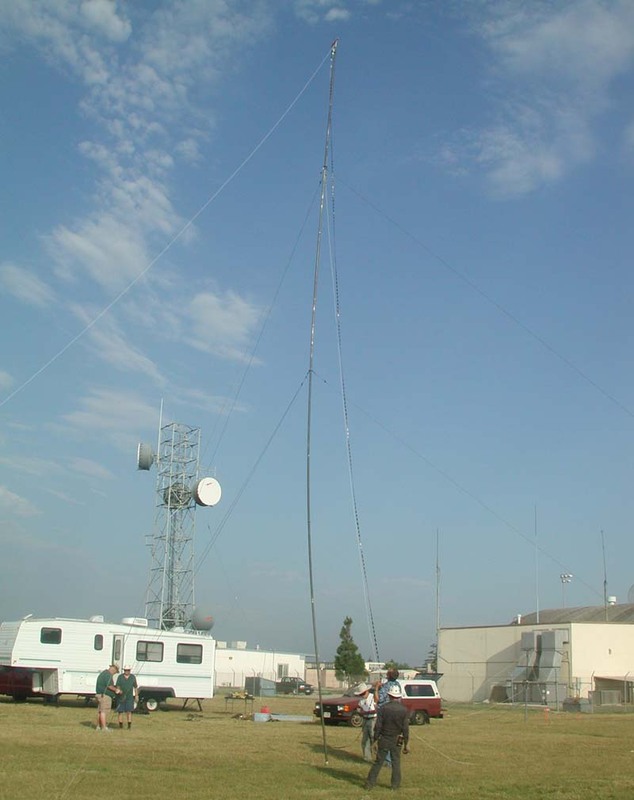 The 80/75/15M station, located in the trailer, initially used a inverted-vee antenna on top of a 50-ft military-grade stacking mast. 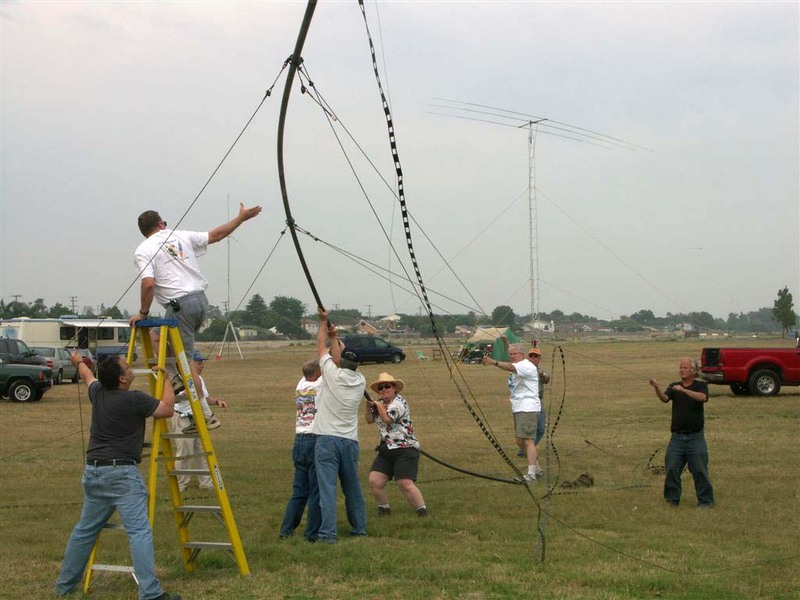 The 80/75/15M team decided to do a "mid-contest-adjustment" on Saturday afternoon. 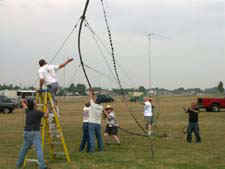 They installed two long wires in a "vee shape" out towards the East coast on the 50-ft military mast. One of the operators of the 40M team is Howard-WB6TIK. 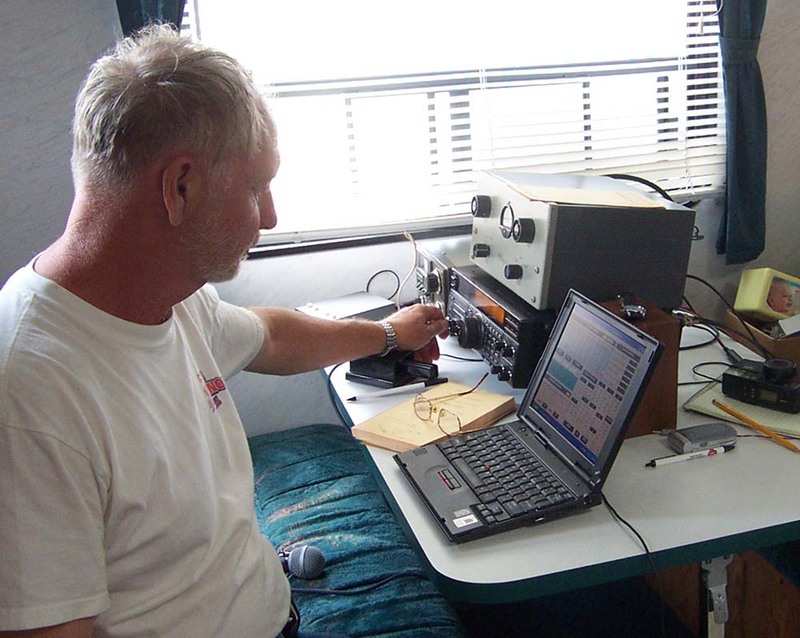 The 40M team had a record 512 SSB QSOs and a respectable 89 CW QSOs. 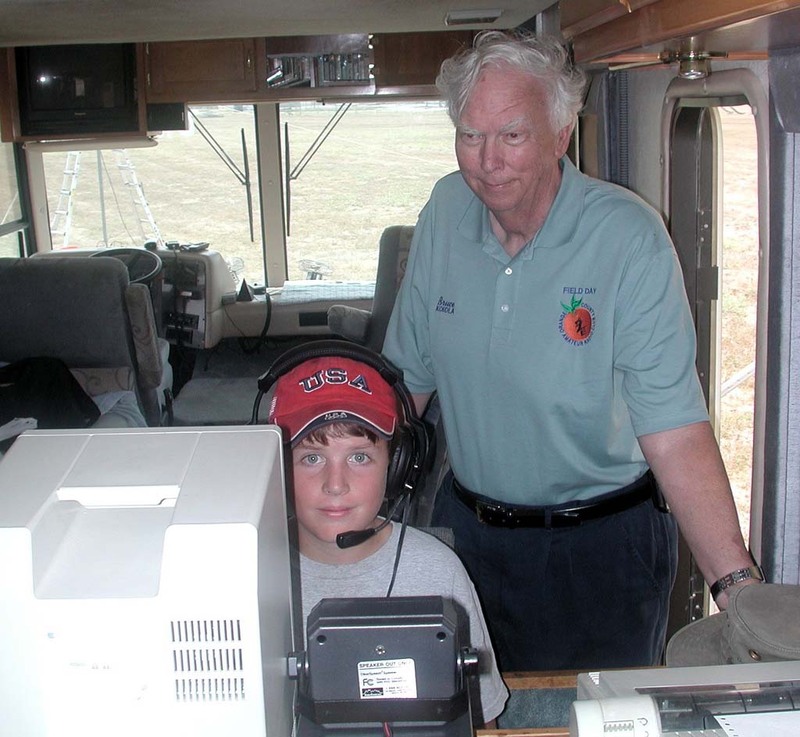 Bruce-KC6DLA (in his brand new OCARC FD shirt) guides Matt, son of Howard-WB6TIK on 40 meters. 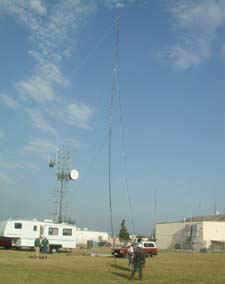 Here is the record setting 40M antenna - a rotatable 2-element inverted-vee-beam on a 40-ft high mast. 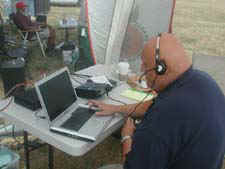 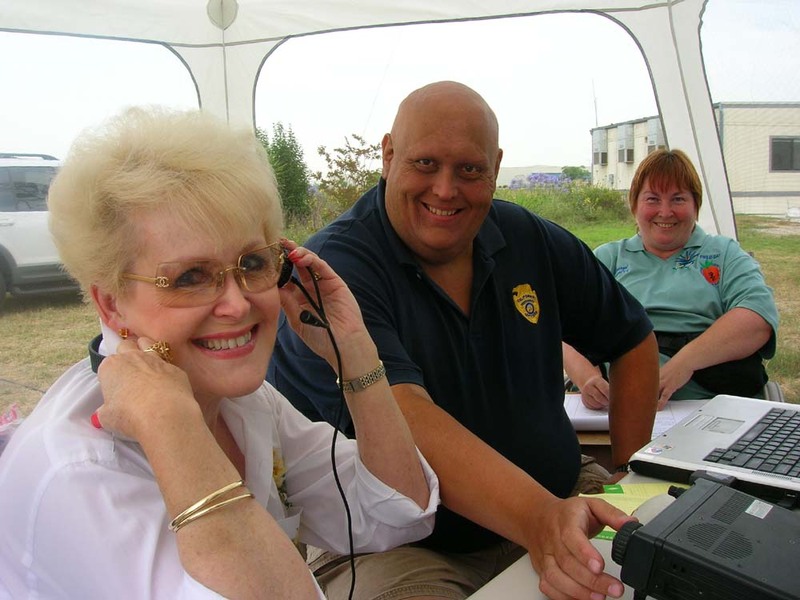 Team captain Ken-W6HHC takes a turn on 20M SSB while Chris-KJ6ZH logs. 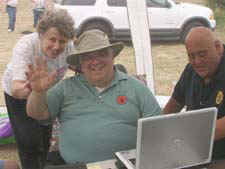 20M propagtion turned out be much better than expected (even though there were ZERO sunspots that week-end). 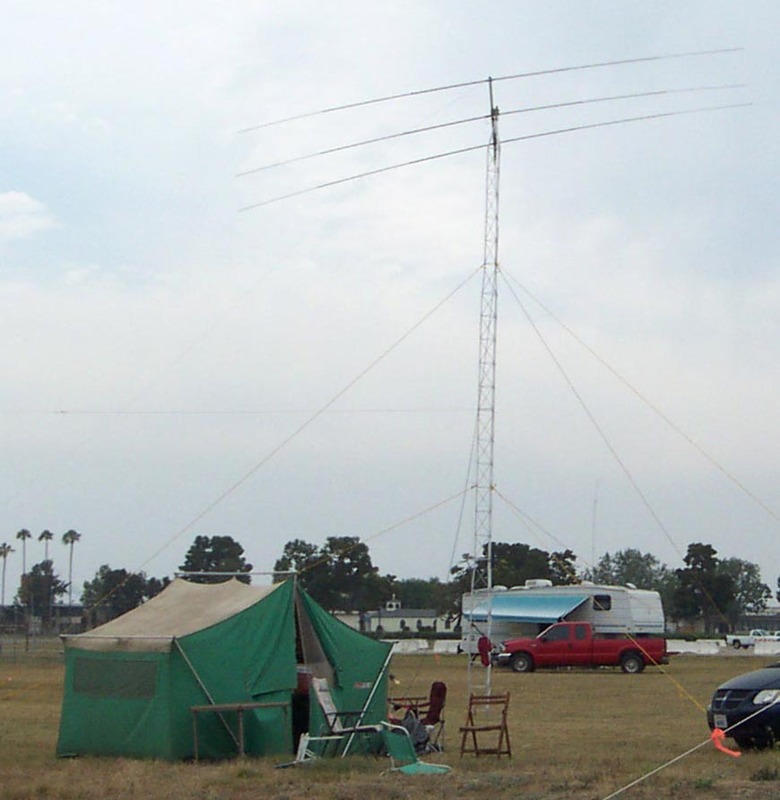 Europe rolled in at midnight with S9 signal strength. 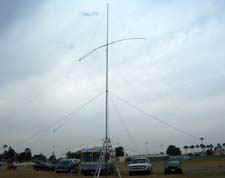 Here is the 20M 3-ele Hy-Gain beam sitting on top of the the club's brand new 40-ft alunimum tower. 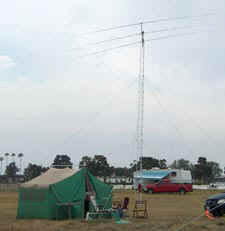 The green-gray tent housed the 20M station. 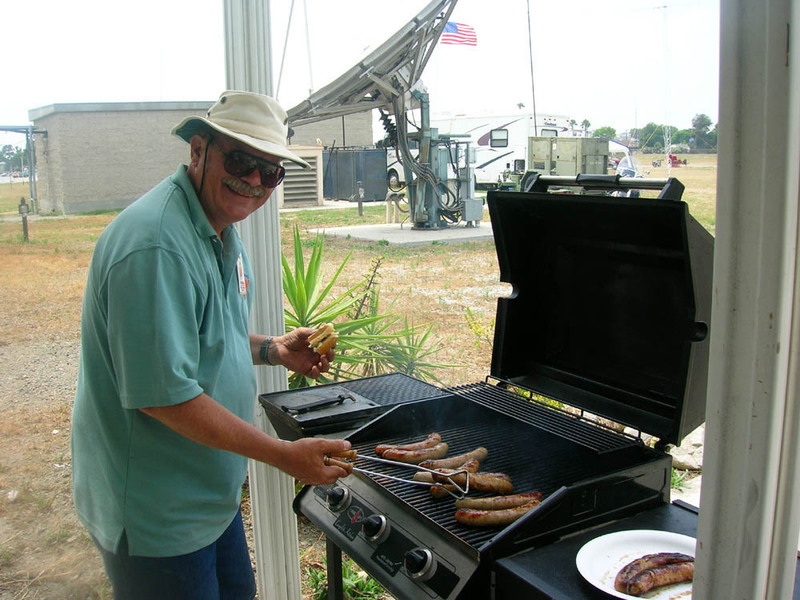 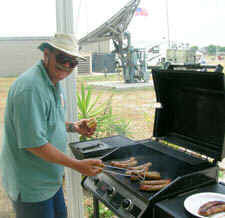 Ken-W6HHC cooks up a traditional batch of bratwurst for lunch during the contest. 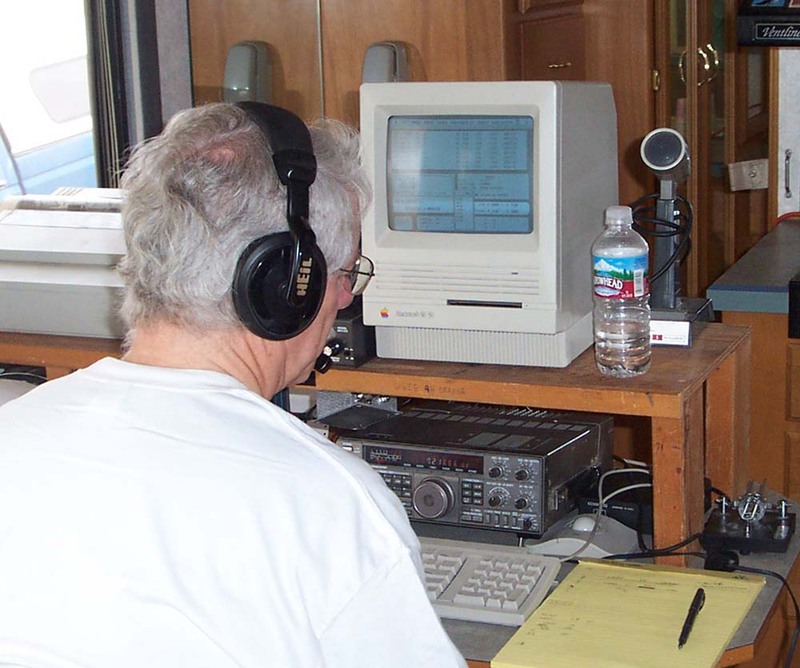 Larry-K6YUI was the team captain for the full-time RTTY HF station. 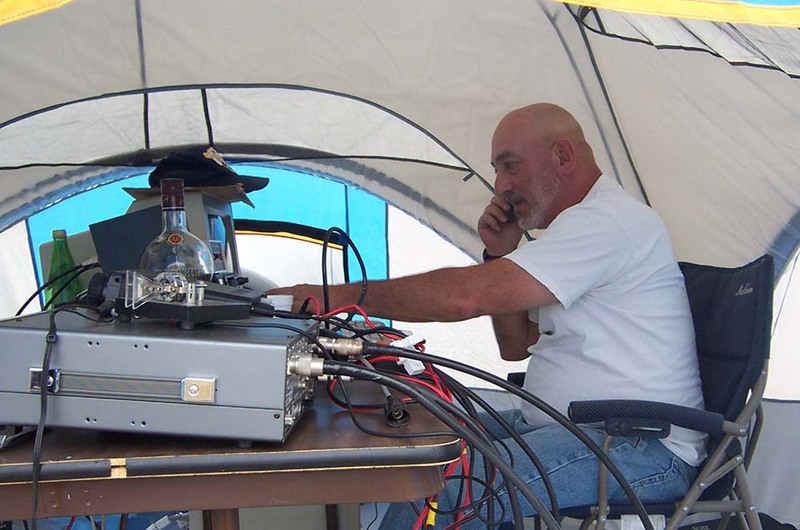 He shared a tent with VHF/UHF, which has equipment in the foreground. 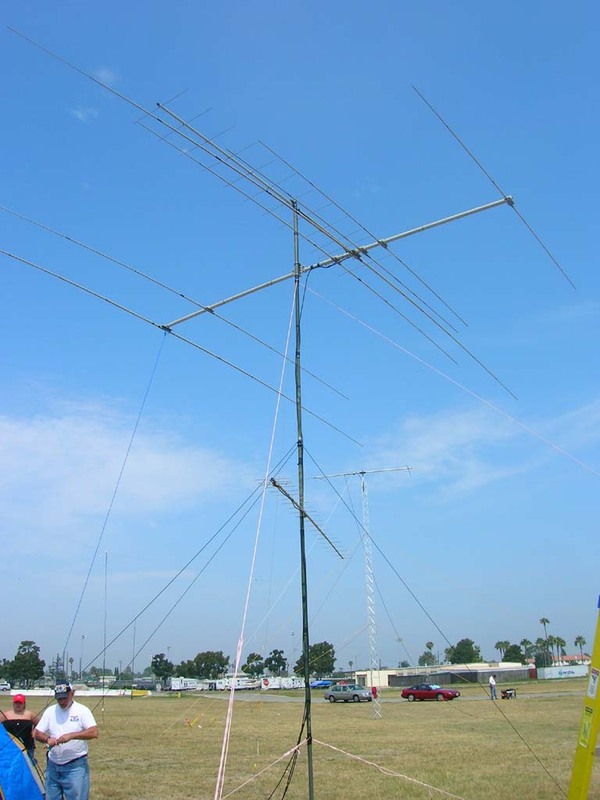 The HF RTTY station operated with a Force-12 C3: 10/15/20 tri-bander beam that is shown at the top of the mast. 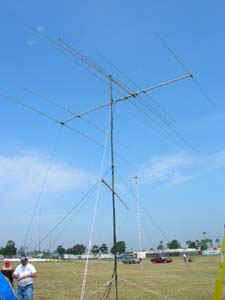 Shown in the lower-corner are Kristin-K6PEQ and Larry-K6YUI. On the right, Paul-W6GMU operates the RTTY station. 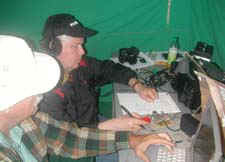 The GOTA station (Get On The Air) is a good place for hams to gain practice in contesting. Willie-N8WP, who provided coaching, gets the logging program working. 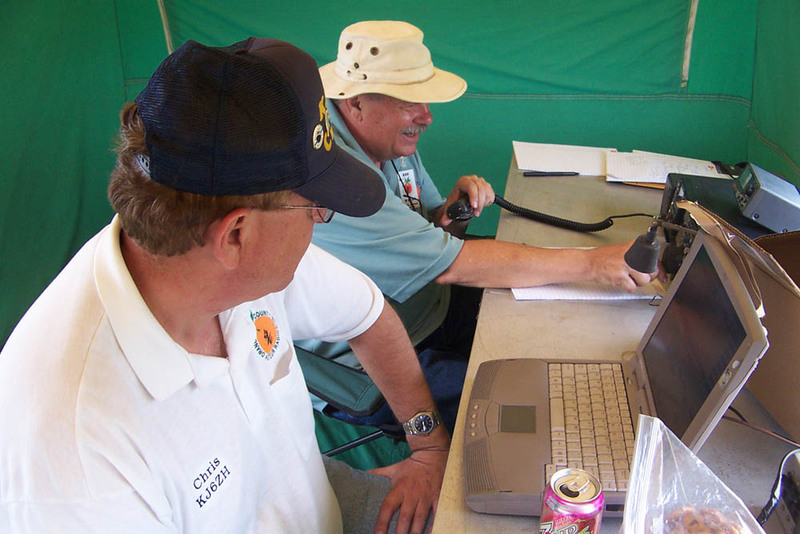 (L-to-R) Doris-WB1CDD, is getting instructions on using the GOTA logging program from hubby Steve-N1AB while coach Willie-N8WP looks on. (L-to-R) Sharon - K6IRD operates the GOTA station as coach Willie-N8WP watches. Cheryl-KG6KTT relaxes after working more than 50 GOTA contacts.